Holiday Inn Geneva Airport Hotel located at the Swiss border, on the French side, is the perfect 4 stars location for business travellers, who would like to be next to Geneva and enjoy the country side&regs quietness.At only 10 km from the International Cointrin Airport, our complementary shuttle bus is at your disposal from 6.30 am to 10.30 pm. 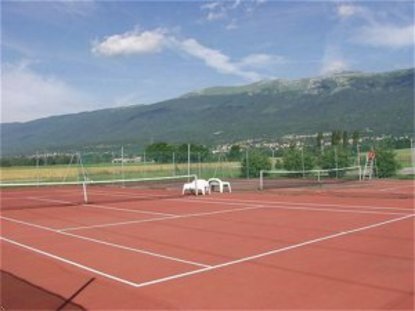 The bus service will also carry you to the Geneva and Pays de Gex&regs business areas.Tourist will also appreciate the hotel location, to practice many sports such as ski, country bike, horse riding, golf and trekking. Connecting rooms and our large complementary parking will suit family and group travellers. The 95 large rooms, including 52 non smoking rooms of the Holiday Inn Geneva &reg Thoiry are all equipped with air conditioning and wifi access. Request one of our 22 executives or 2 Suites rooms with king size bed.The restaurant offers a &regBrasserie&reg lunch around a fine starter and dessert buffet and a &rega la carte&reg diner in a cosy atmosphere. Do not hesitate to ask our barman for one of his special wine tasting. Be successful in organizing your meeting, conference or banquet, from 2 to 300 persons, at the Holiday inn Geneva Airport France proposing 400m&reg divided into 6 meeting rooms. All our conference rooms can be equipped with plasma TV, video projector, sound system and business center.